David Schaeffer recounts the everyday challenges of training, traveling, and attempting to stay up with younger climbers and professional guides, in his attempt to reach the summits of Mount Rainier in Washington State, Mount Fuji in Japan, and Cho Oyu in Western China (the sixth highest mountain in the world), and to complete the strenuous treks to Everest Base Camp and Machu Picchu via the Inca Trail. This book examines why Coach Paul W. “Bear” Bryant and the University of Alabama football team waned in the late 1960s and how was it revived in the 1970s amid the social and political changes of the Civil Rights Movement. Termed the greatest program builder in the history of college basketball after winning more than a hundred games at four different Division I schools, all of which had fallen on hard times or never enjoyed hoops success, Charles "Lefty" Driesell was a transcendent figure in his sport for more than forty years. Despite never coaching at one of the college game's traditional powers, and despite losing two seasons in the middle of his career due to the tragic actions of another, Driesell still ended his career as the fourth "winningest" college coach at the time he retired in 2003 with 786 victories, coaching at Davidson, Maryland, James Madison, and Georgia State. What does it take for a regular guy to climb some of the highest mountains in the world? FIVE BIG MOUNTAINS takes you there, instantly placing the reader and the author on a steep glacier on Pico de Orizaba with equipment trouble and the tough decision any high altitude climber inevitably faces--should he turn back or keep going to the summit? The central theme of the book is that with proper preparation, careful planning, persistent training, and the best guides, even an amateur with little mountaineering experience can climb and reach the summits of some of the most famous mountains in the world, though there are risks involved that need to be minimized. What does it take for a regular guy to climb some of the highest mountains in the world? Five Big Mountains takes you there, instantly placing the reader and the author on a steep glacier on Pico de Orizaba with equipment trouble and the tough decision any high altitude climber inevitably faces—should he turn back or keep going to the summit? Game Day and God: Football, Faith, and Politics in the American South takes seriously the often-stated assertion that college football in the South is a religion. To this end, Eric Bain-Selbo draws upon a wide range of theoretical approaches in religious studies and cultural criticism. He also relies upon field research on several campuses in the Southeastern Conference where he interviewed fans and experienced “game day.” Game Day and God also recounts the role that college football has played in Southern history and culture. Going back as far as the Civil War, the work explains the cultural meaning of college football in the South, delivering a much-needed critical perspective to the subject. “The ball was round, the equipment was homemade, and the rules were uncertain, but that game the boys were playing on the lawn at Mercer University in 1892 was football.” Thus begins this colorful history of football at Mercer University. 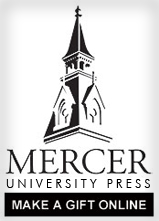 This volume describes in sharp and clear detail the history and evolution of college football as played by the Mercer University team from 1892–1942. After a seventy-year hiatus, the Mercer Bears will once again take the field in the fall of 2013. What you do not know about Georgia’s greatest athletes and some of its leading citizens you will learn in Gene Asher’s Legends. These and formerly untold stories of Georgia Bulldog immortal Charley Trippi, eighty-six-year-old Furman Bisher, who continues to be one of the most prolific sports columnists in America, and Lee Burge, the man who went from the mailroom to the boardroom of Equifax are among many other sports and civic greats included in Gene Asher’s Legends. Life of Dreams is the first complete biography of Fred McFerrin Russell, one of the all-time stars in sports journalism. This biography details how the Vanderbilt man started with the Nashville Banner in the late 1920s, ascended to Sports Editor and remained with this paper loyally for sixty-nine years. Russell built long-lasting relationships with coaches, players, and other writers in the business, and he wrote with a style that reflected his personality: fair, informative, and always with a sense of humor. He was a storyteller, whether it was athletes such as Bobby Jones or Red Grange; or coaches such as Red Sanders or Paul “Bear” Bryant, one of his closest friends. Outliving almost all of his contemporaries, Russell rubbed elbows with some of the greats of the twentieth century, with men such as Sparky Anderson, George Steinbrenner, Archie Manning, Vince Dooley, and Lou Holtz. To celebrate baseball and sing the national anthem for more than 100 minor league baseball games during a single summer, Joe Price drove more than 25,000 miles through forty states. Accompanied on the zig-zagging, cross-continental trek in an RV by his wife who had not been a baseball fan, he often shared games and baseball stories with relatives and friends along the way. Throughout the journey he experienced how baseball brings people together. Grounded in their respective communities, each ballpark reflected specific products, habits, and values associated with its location, and often evoked and formed distinct baseball memories and stories.